We believe that no one should be afraid of their own data and that data is most powerful when it is shared for the common good. Decisions can no longer be made in a vacuum. Sectors and industries can interconnect in ways that make lives better for everyone, but only if these relationships can be seen. We don’t just pump out reports. We know you don’t want over-engineered advice that is out of date before you even see it; but real-time knowledge you can use today. We know this because we’ve listened. That’s why we've spent years building and perfecting a platform that makes data reveal what it’s been hiding, connecting dots you never knew existed. By placing our IP at your fingertips, our software will save you time, money, mitigate your risks and show you the full picture. Kinesis’ mission is to enable more sustainable, equitable and productive cities by connecting decision makers to meaningful data. By drawing together diverse data sets and adding a layer of expertise and analysis that is both powerful and artful, Kinesis creates new knowledge; knowledge that governments use to uncover trends to make better policy decisions, and that businesses use to make better investments. The Kinesis platform consists of three interconnected and complementary applications which leverage a centralised data ecosystem; CCAP Integrated, CCAP Precinct, and CCAP City. Drawing on this diverse data, users can discover previously unknown cross-organisational relationships and make the world better, one well-informed decision at a time. Kinesis is much more than a data visualisation tool. It’s a decisioning engine built by a team of engineers and urban experts. A team who calls things as they see them and who make complex systems simple, without ever dumbing them down. 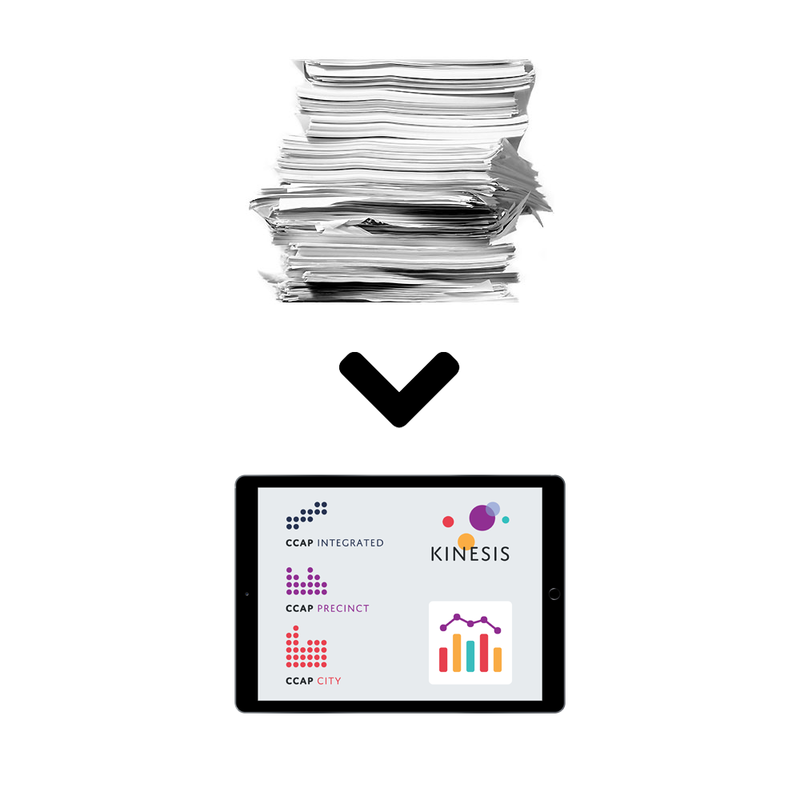 So, importantly, when you licence the Kinesis platform, you get more than just software. You also receive access to our award-winning team of technical, scientific, economic, urban planning and policy analysts who have unmatched experience in the delivery of sustainability solutions across all levels of government and the corporate sector. We strive to give our clients more than insight; we provide outsight – the power to discover previously unknown external relationships. The result is the most-informed, efficient and effective decision you can make.